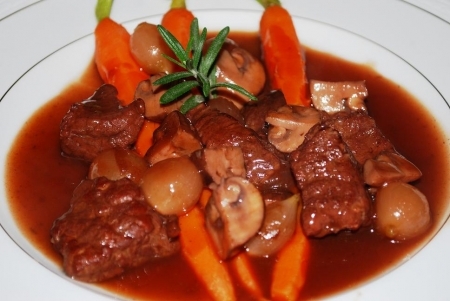 This particular version uses port instead of red wine for a more robust sauce. For a dinner party, steam baby carrots with some stems attached for a great presentation. Or make it a one pot meal and add peeled potatoes or new potatoes and add baby carrots or peeled and chopped carrots. Add beef, flour and salt and pepper to a large Ziplog bag and shake to coat beef. In a large Dutch oven or large pot, heat olive oil over medium high heat. Remove meat from bag one piece at a time and shake off any excess flour. Sear meat in batches and transfer to a large plate. Don’t overcrowd the pot or meat won’t sear. Add mushrooms and sauté until tender. Add the garlic, rosemary, thyme and bay leaf and sauté for about 30 seconds or until fragrant. Deglaze the pot with the port, scraping up brown bits at the bottom of the pot. Add broth, tomato paste, beef and pearl onions. Stir and bring to a boil. Reduce heat to low and simmer uncovered for at least four hours, stirring often. Remove the beef and reserve on a plate. Discard the rosemary and thyme sprigs and bay leaf. Make a thickening agent by whisking cornstarch and water. Gradually whisk the thickening agent into the boiling sauce. Sauce will not thicken until brought to a boil. Add a dash more of kosher salt and pepper to taste. Add beef back to pot. Serve family style or plate as shown. Classic Mashed Potatoes and fresh steamed carrots. Try Barton & Guestier Margaux (France), Château La Confession Saint-Émillion Grand-Cru Jean-Philippe Janoueix (France), Château Croix de Rambeau Lussac Saint-Émilion (France), Stag’s Leap Wine Cellars Artemis Cabernet Sauvignon (Napa Valley) or J. Lohr Paso Robles Merlot (California). This recipe does not call for a bouquet ganri, which is a French term that means wrapping the herbs in cheesecloth and to tie with kitchen sting. Often times it is tied to the handle of the pot if it has one. The purpose of a bouquet garni is for the dish to have the flavors of the herbs and to easily remove them. Herbs easily fall off the stem when cooking and some people do not like the herbs in the dish, but like the flavor. I like the herbs, so I don’t use a bouquet garni. It is your option to use it or not. Another option for creating this meal is to follow the steps thru bringing the dish to a boil and transfering to a crock pot to simmer. Remove from crock pot to finish off off or if it has a boiling setting it will not need to be transferred to thicken the dish. Using a crock pot allows you to leave the house and come home to a great French meal!